I love finding budget-friendly pieces that look just like the designer ones for a fraction of a cost. I noticed this Topshop fringe coat a few weeks ago. All three of these pieces - the satchel, sweater, and coat could be worn together for a complete look. There are a lot of sales right now. I have a feeling we are going to see a lot of great sales before Black Friday. If you liked the pink shift dress (which would be perfect for a party this season) or the green wool coat - they are both 40% off along with everything else! 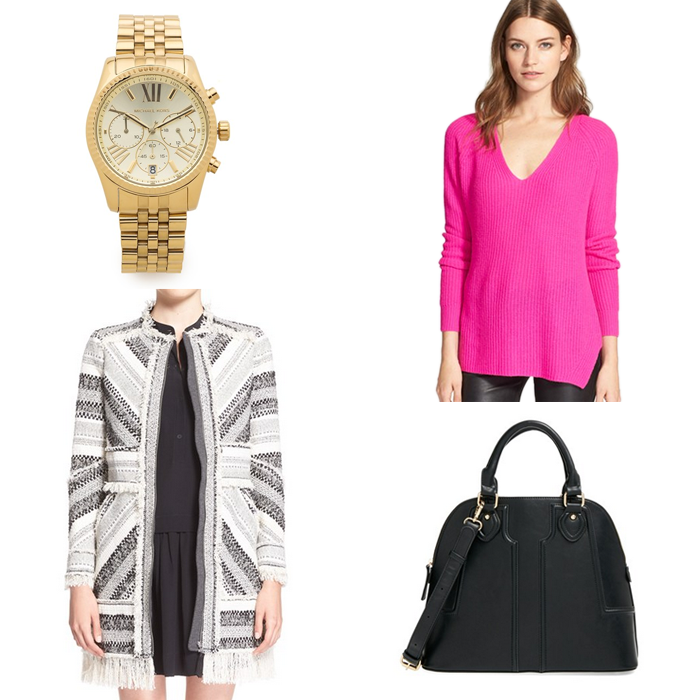 AND... there is up to 40% off a lot of great items at Shopbop right now! Don't miss out - it ends in a couple days! You can get the popular Michael Kors Lexington ($150) and over-sized watches for 40% off! Michael Kors watches - including the popular gold Lexington for $150! BB Dakota sweaters - including the fur trimmed sweater vests! BB Dakota plaid jackets - like seen here. Also, the clearance sale starts tomorrow at Nordstrom. 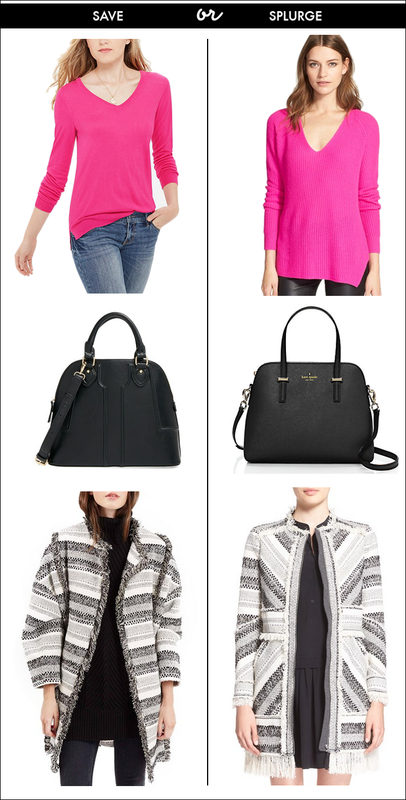 I love the idea of this hot pink sweater with the b/w jacket or sweater over it. I need to put together an outfit like this! Great work on finding the similar, more affordable items! That Rebecca Minkoff coat is so dreamy! if I save on the first two, I can splurge on the last one right? Haha! Great picks Lisa! That last coat is a great match! !